One of the mental challenges to being a pregnant athlete is that every time you adjust to one change or limitation another one seems to pop up. Up until this point I had been cruising along, literally, still riding five days a week or so. I wasn’t riding as far or as fast, but I was still out there. Week 23 was yet another turning point in my journey of training through pregnancy. The baby was now at the point where it weighed over a pound and was going to begin growing more rapidly as the weeks progressed. I was starting to feel more of a toll on my body in different ways which posed some new challenges for me. In the first days of week twenty three I was teaching an indoor cycling class and during a short hard effort I started to feel a cramp like a side stitch in my lower abdomen. I have never gotten a cramp like that while teaching indoor cycling. I attempted to stretch by sitting up taller and even got off my bike for a minute to walk around the room. The cramp subsided relatively quickly, but I was definitely thrown off a bit by it’s occurrence. The following day I went out for a bike ride and experienced the same type of cramping about twenty minutes into my ride. I stopped for a minute to change position and stretch. I was beginning to think the cramp might be partially due to my bike shorts cutting into my abdomen as my stomach was growing and my shorts were becoming a bit too tight. I decided to exercise caution, cut the ride short, keep it flat and just casually pedal home. When I got home I did some research and did discover that tight clothing could lead to cramps during pregnancy. I thought I had solved the mystery and could get back to riding comfortably wearing slightly larger clothing. 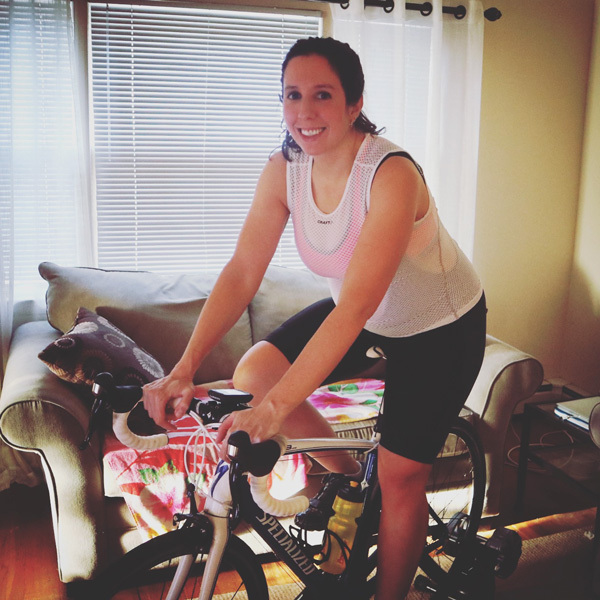 A couple of days later I wanted to ride outdoors again, but it was an extremely cold and windy day and so I opted to do an indoor trainer ride instead. I was instantly happy that I made the decision to stay indoors because I felt strangely uncomfortable on the trainer. 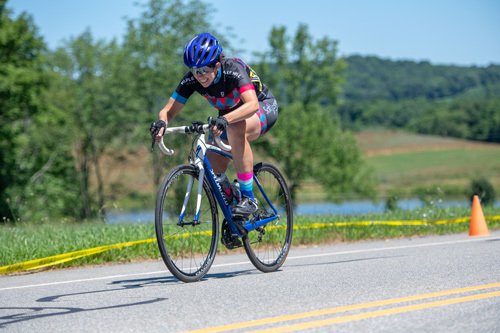 I wasn’t having the same cramps, but I felt like I couldn’t comfortably breathe in my normal riding position and my legs felt extremely fatigued. I rode indoors for about forty-five minutes just to break a sweat, but that was enough for me. My legs continued to hurt, even when I got off the bike, my back hurt too, and I was just extremely uncomfortable. This was probably the worst I felt physically up to this point in my pregnancy. I felt nauseous a bit during the first trimester but this was a different kind of unpleasant feeling. My body ached probably because the baby was growing more rapidly and my body was being forced to expand and change to accommodate this growth. When I did ride outside again I felt much better than I had that one day on the trainer (thank goodness! ), but found I was having to work much harder to push even a moderate pace on a flat road. I looked down several times during my ride and my heart rate was jumping up toward 170bpm even at what used to be a relatively easy pace. I had already slowed my pace down and cut my rides shorter over the past several weeks, but apparently I was just going to have to go slower and slower from now on. I felt like every time I adapted my routine my body would throw me another curveball and force me to adapt again. I had learned to accept my limitations up until this point, but the limitations to my abilities were continuing to grow and it was becoming more difficult to take. I was discouraged and felt like these changes were going to be permanent even though logically I knew that they were temporary. 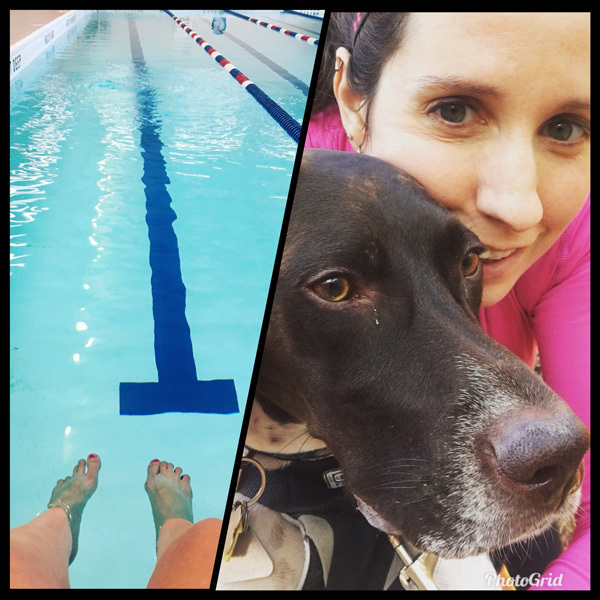 Switching up my fitness routine to include some different activities in the second half of my second trimester. I decided that instead of becoming discouraged I was just going to have to change up my routine, try to keep active and maintain some level of fitness as I moved later into my pregnancy. I started to cut out a couple of days of riding and replace the rides with other activities. Some days I took hikes with my dog just to get some fresh air without the strain of being on the bike. I also added some swimming back into my weekly exercise routine. Honestly as an athlete the cross training was probably good for me anyway. Even though I was frustrated by my limitations at times I recognized that I could still stay fit and strong throughout the coming weeks with some additional adaptations to my training routine. 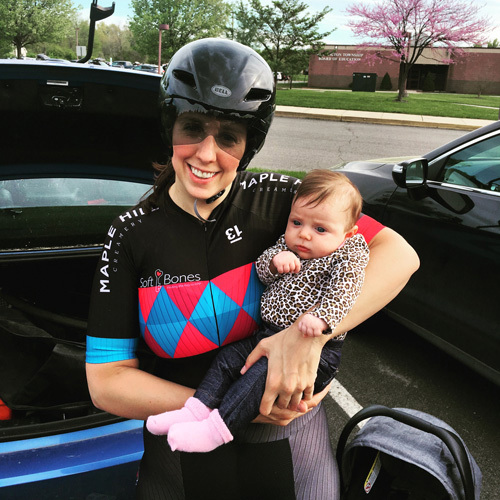 I had to learn to accept the changes as they came knowing that in just thirteen weeks or so the baby would be here and I could set my sights back to training like I had been before.